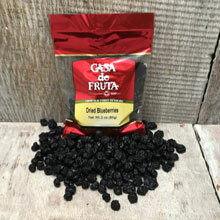 Dried blueberries sweetened with cane sugar. Dried blueberries pack four times the antioxidants of their fresh counterparts! Packaged in a 3 oz. bag.